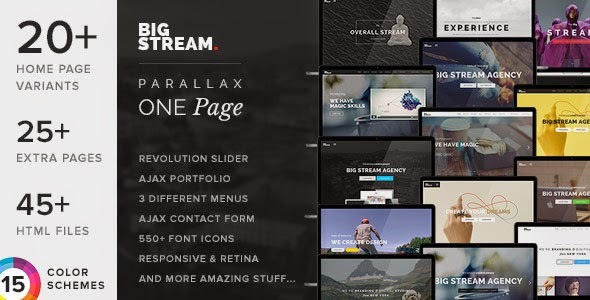 Big Stream is 100% responsive parallax template with clear and neat design. It will perfectly meet the needs of digital agencies as well as needs others. Big Stream has 20+ different demos, 25+ extra pages, 45+ files, 15 colour schemes, 3 menu variants and much more. You will get the Revolution Slider for free and save $14. Also Big Stream is well documented and can be easily customized to implement your ideas. Item Reviewed: BigStream One Page Multipurpose Template 9 out of 10 based on 10 ratings. 9 user reviews.